One of the surest signs of Spring at our preschool is the arrival of two large incubators and this year I volunteered to be one of the “Mother Hens”. It was exciting as two dozen fertilized eggs arrived in our classroom and it was wonderful to see how patiently each of our students waited to gently put “their” egg into the incubator. The incubators were placed in two classrooms where all our school’s children came to visit the gestating eggs. We counted down the approximately 21 days until the chicks began to hatch and then the children got to watch as the baby chicks emerged from their shells. 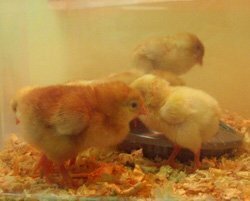 When the chicks were strong enough they moved to a special container where the children watched them grow and change daily.